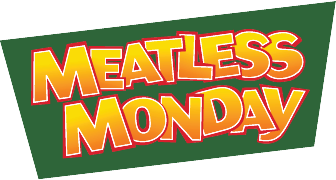 Meatless Monday is a global movement that supports vegetarian cuisine. Eating less meat and animal products is good for our health, our planet, and our animals. Much of our reluctance to eat vegetarian dishes comes from not knowing how to cook them and not tasting them. Vegetarian cuisine is new to me and I had to relearn how to cook when I decided to reduce meat and animal products from my diet. Learning how to make one new recipe a week is a good way to increase our cooking inventory and our health. Meatless Monday aims to do just that. Visit their website for a host of recipes and meatless meal ideas. Reducing all meat and animal products from our diets can be intimidating. Especially if we are accustomed to having it at every meal. So, for motivation, consider these facts. According to a well-known European study of 300,000 people, eating the same amount of calories, those who eat meat will steadily gain weight. The only weight loss plan that has worked for more than a year is a high nutrient vegetarian diet and a vegan diet is even better. Beware of the high protein, meat-eating diets. They do not work for more than a year and are terrible for our health. Eating meat is linked to obesity and a host of diseases while eating a high-nutrient plant-based diet is linked to an increase in health and well-being. Lastly, but even more important than our personal health is that the impact of all this meat-eating is slowly killing our planet. There is no more grazing room for our cattle and so grass-fed is available for only a small portion of our farm animals. Meanwhile, in other less developed countries, forests are being cut down for more pasture to raise animals for meat consumption. While here in our own country, our animals are fed a corn meal diet which is bad for them and dangerous for us. The conditions in which these animals live and die is heartbreaking. Grass-fed and cage-free can be a panacea for daily meat-eaters who think these animals are better off. Even in the best conditions, their end is all the same and the torture that goes on behind the slaughterhouse doors is our generation’s biggest secret. What will our children’s children know us best for? Our incredible advances in technology? Our medical and pharmaceutical strides? Perhaps, but they will also know us for our daily habit of feeding ourselves way too much and how it negatively affected the planet and how cruel we were to her animals. Do not be a party to it. Consider what God would have us do. This week my husband related the story of Daniel to me. Daniel was captured by the Babylonians as a youth and immersed in their alien culture. He was required to eat the royal diet which was heavy on rich sweet meat. Daniel refused the diet knowing that his God would not be pleased. When Daniel asked the guard to give him and his friends only vegetables, the guard became afraid that Daniel and his friends by eating only vegetables and no meat would wither away and become physically feeble. The guard greatly feared the king would kill him for not feeding the captives the royal diet. But Daniel insisted and told the guard to test him and his friends by feeding them only vegetables for ten days and then see if they looked worse than the others who were eating the rich meats. And so the guard agreed and after ten days Daniel and his friends looked healthier than any of those eating the royal meat-filled diet. Resisting meat, chicken, pork, lamb and all dairy products may seem like swimming upstream but we do not have to live as strictly as Daniel. As Christians we are free to eat anything so long as it does not hurt our brothers and sisters. Since daily meat-eating does have a negative impact, it would be wise to refrain from eating so much meat and dairy. Instead, start by joining Meatless Monday and learn how to cook a high nutrient vegetarian dish once per week. Or try to follow the Mediterranean diet which provides for small amounts of chicken and fish, a little cheese and yogurt and only a bit of meat every once in a while. You will feel better and you will rest easier.